There’s a new Tesla in town. It’s a shiny new Tesla Model S Shooting Brake built by coach uilders RemetzCar and penned by London-based Niels van Roij Design. It was launched at the Dutch Embassy in London so I went to have a look at it, and to be given a passenger ride by the man who commissioned it: Dutch car enthusiast and shooting brake superfan Floris de Raadt. De Raadt is a big fan of shooting brakes—longroof cars that traditionally have two doors, but sometimes have four—and buying and restoring them is his jam. However, he fancied being involved at the start of the process rather than at the end for a change, so commissioned RemetzCar to build him his very own using a 2013 Tesla P85 as its base. According to van Roij there were two main approaches to modifying the car’s design: an approach from the B-pillar back (redesigning the car from behind the front doors to the back, most likely requiring new rear doors) or C-pillar back (keeping the rear doors stock and working from there rearwards). A C-pillar approach was taken, but it meant the sedan’s sloping roofline had to be kept and roof modified around it. Adding some extra roof adds some visual clout to the back of the car, something that Van Roij has managed wonderfully – the chrome accents and ducting help the new detail stand out, while horizontal lines appear to take some weight out of it. It looks pretty special, especially the chrome piece on the D-pillar—it’s huge but draws your eye and, most importantly, fits in with the rest of the car’s look. The chrome accenting continues on the roof as well, meaning any helicopters chasing you will get a pretty view from on high. The extra roof has added ‘a few kilograms’ to the car’s overall weight and has apparently improved structural rigidity. Van Roij commented that Tesla was cool with the project, though they were told not to mess with any of the car’s electronics. The additions haven’t messed with the car’s aerodynamics, and in fact it means that rain doesn’t hit the rear screen once you get moving, they say the only time you’ll see water on the glass is when you’re sat at lights and drops roll off the roof. However, de Raadt insisted the car have a rear wiper much to van Roij’s dismay. Mercifully a solution was found: It hides under the car’s rear spoiler and keeps the lines clean. There are a few neat touches other than the obvious bodywork. 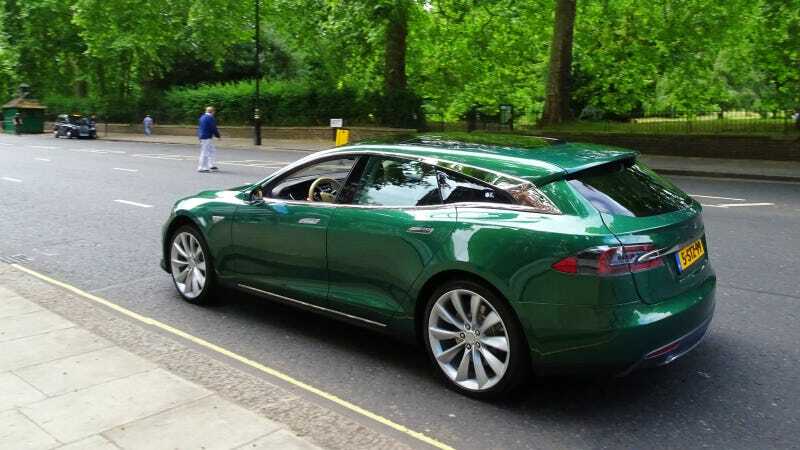 The color, for example, isn’t a standard Tesla hue, and is mirrored inside on the seat piping, glovebox interior, and around the rear-view mirror. The steering wheel is color matched to the interior as well. Smart. Now, this being hand-built, one would go in with some hesitance as to whether it would feel solid on the move. Well, to prove its worth de Raadt took me out for a spin around the block and three things became immediately clear: 1.) It doesn’t squeak or rattle at all. It only makes the noises Teslas are supposed to make. 2.) There’s a ton of headroom in the back. The sedan can be a bit tight on taller passengers but the extra height in the shooting brake takes that problem away. It makes the rear feel much more airy as well. 3.) De Raadt likes driving… spiritedly. He’s a man who enjoys being thrown around. “I love acceleration and G forces,” he commented as he stabbed the throttle hurling us down the road. He loves to drive, loves speed, and cars with long roofs that shouldn’t actually have long roofs. A shooting brake EV is right up his alley then. The team behind the Tesla Shooting Brake will make “around 20" of them—could be more, could be less, apparently—and if you’re keen you’ll need a donor car and at least £80,000 (before VAT) (roughly $107,000 before tax) to get the ball rolling. Though if you want to do more to it, prepare for that cost to go up. Hm. A 'Hand-Built' Tesla You Say? Sounds Familiar.